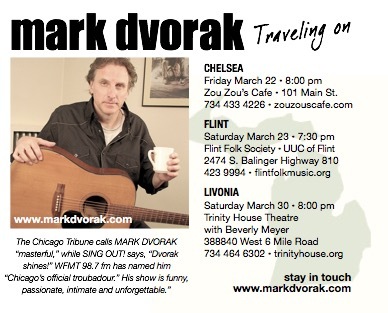 CHELSEA MI - Zou Zou’s Cafe, 101 Main Street welcomes Chicago’s "official troubadour" Mark Dvorak for an intimate acoustic performance on Friday, March 22 at 8:00 pm. “At this stage of the game,” said Dvorak, “I feel like I’m doing my best work. 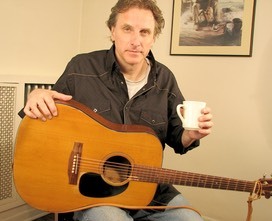 I’m hoping to get the new CD out this year and am very excited about it. I’ve got some new material coming along, and I’m including a bunch of different things I like to do before a live audience. Zou Zou’s Cafe has been part of the Chelsea community for over twenty years, presenting music and serving sandwiches, salads, breakfast, desserts coffee drinks and more. There is no cover charge for the music but listener donations are encouraged. For more information phone 734 433 4226 or visit www.zouzouscafe.com.